Being John Malkovich. Propaganda Films 1999. This is a really weird concept. Like perhaps many other people or perhaps nobody else, the only reason I know the name “John Malkovich” is because of this movie’s existence. Other than some trippy ideas and actor rage, I have no idea what to expect from this film. This is the part where I ramble about the blog itself to fill space. Craig Schwartz is struggling to make a living as a puppeteer to support his wife Lottie and her many exotic pets. In order to actually pay the bills, he takes a job as a filing clerk in an unusual office where he meets Maxine, whom he becomes immediately enamored with, largely because she won’t give him the time of day. In the office, he finds a portal into John Malkovich’s head, and he and Maxine go into business selling tickets for fifteen minutes there. When Lottie tries out the Malkovich experience, Maxine initiates a strange, three-person romance with Lottie/Malkovich, much to Craig’s heartbreak. Craig uses Malkovich to trick Maxine into being with him, and discovers an ability to puppet Malkovich as nobody else could. When Maxine finds out this deception, she decides to manipulate Craig into using Malkovich to benefit her. But Lottie discovers that yet someone else has designs upon Makovich’s body, and wants Craig out. Wow, two really depressing movies in a row. Somehow, though, this one is more satisfying. Putting aside the fact that it explores (or refuses to quite explore) the idea of identity, souls, and the mind, a topic I find interesting, the story goes to dark places to which I’m almost interested in being led. 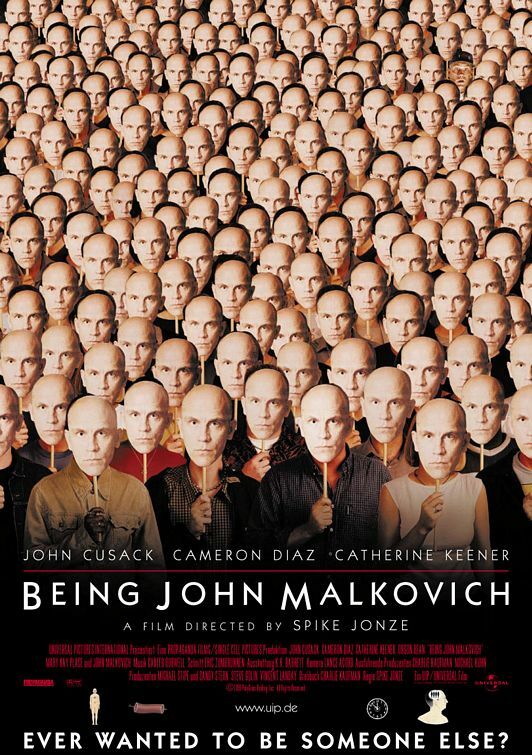 Of course, the most interesting performance in this film is Malkovich’s portrayal of himself/Craig/others. Charlie Kaufman, the writer, seems to like using real people (he wrote himself as the protagonist in Adaptation). I’m most intrigued by the contrast between “Malkovich” and the others. Malkovich the character is very quiet and reserved, much like one would expect of an introverted actor dedicated to the craft, but his understatment is so overstated that he’s almost creepy, and I’m wondering if this was intended to be an honest portrayal of himself, or exaggerated to heighten the contrast of his possession. It occurs to me that I may not know much about acting, since I’m more interested in this larger concept than in the broad swath of emotions portrayed by the other three leads. Technically, I don’t have much to say about this movie, which is surprising because there are several effects shots and some techniques used to suggest the feeling of being inside John Malkovich. Those subjective scenes are done with a vignette effect around the shot, which is a fairly common technique that I don’t believe in, but what else can you do? It’s like the binocular-shaped matte. It doesn’t look like that when you’re actually using binoculars, but how else do you communicate that? I’m more interested in the sound design for those scenes. I kind of wish I could have heard them in surround sound. It would be interesting to do those with one of those binaural microphones designed to hear exactly like the human ear hears, and maybe a jawbone microphone to try to hear his voice and other sounds from inside his own head. They sounded more simulated than that, but at least a surround mix would have enhanced the effect. Although lives are destroyed more completely in this movie than in The Graduate, I feel more positively about this film. In the end, nobody gets what they deserve, except maybe Craig. To be more accurate, nobody gets an outcome I wanted for them. Still, it’s an engaging, thought-provoking, emotionally and psychologically messy film. Watch this movie: and ride the philosophical rollercoaster. Don’t watch this movie: for everything wrapped in a neat package.